Building a website can be a rewarding experience. However, it can feel challenging, too, especially for someone who does not have a technical background. We have prepared this guide to walk you through the entire process of setting up a website. Simply follow along, and you will have your first working website by the end. Your first step is to decide what you want your website to accomplish, and the type of website it will be. Do you want to build a community, share your passion, sell products online, or something else? What you want to do will determine the type of website you will build. Static website. A website with content, but there are no dynamic or interactive components. A dynamic website. A website whose content changes frequently. Examples of dynamic websites include news sites such as FoxNews.com or CNN.com. Interactive website. A website that allows users to interact with the site. Examples of interactive websites are Twitter.com and Facebook.com. Ecommerce website. A website that allows users to buy items or services. Examples are Amazon.com and eBay.com. Blog. A website that allows you to post articles chronologically. When you are building your first website, we recommend that you go with either a static website or a blog. A domain name can consist of two or more levels. Let's take for example the domain name www.google.com. In this case, "com" is the first-level, or top-level, domain; "google" is the second-level domain, and "www" is the third-level domain (also called a subdomain). A domain name is part of your brand identify, and allows people to reach your website without having to know the IP address of your site. When you are choosing a domain name, you are in fact choosing both the top-level domain name and the second-level domain name. You do not need to worry about third-level domain names because once you register your domain name, you can create as many subdomains as you want. There are many top-level domains available. 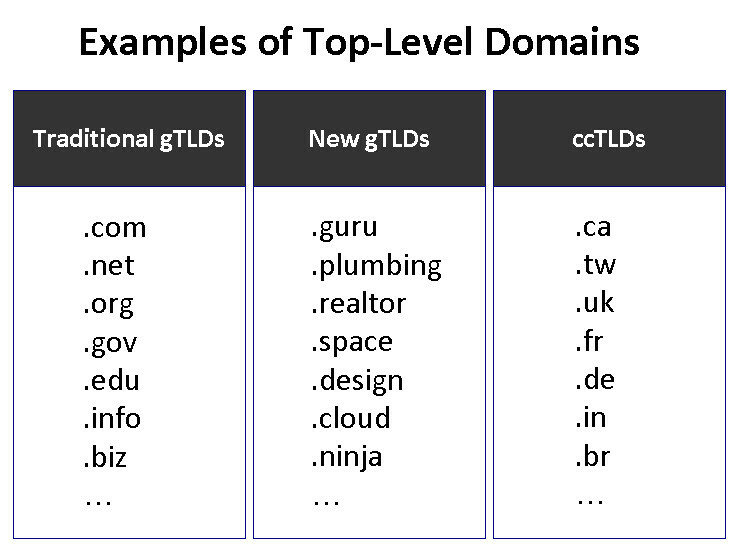 There are two main types of top-level domains: generic top-level domain (gTLD) and country code top-level domain (ccTLD). Generic top-level domains are domains that are not dependent on geography. Examples of gTLD's include .com, .net, .org, and .guru. Country-code top-level domains are domains that end in the two-letter country code. Examples of ccTLD's include .uk, .de, .tw, and .in. In general, .com is the top-level domain you should target. If the .com version of the website is not available, the next best choices are .net and .org. For these three gTLD's, there is no restriction on who can register a domain. This is not the case for top-level domains like .edu, for which you need to be an educational institution to be eligible. If you are outside of the United States (or if your primary audience is in a country outside of the United States), it may make sense to use a ccTLD for your top-level domain. Note that some ccTLD's have restrictions on who can register a domain (for example, residency requirements), so please check these requirements before you proceed to register. With the introduction of new gTLD's starting in 2013, there are alternative domain names in addition to the ones mentioned above. In general, though, I would only consider the alternative if the gTLD is very relevant to the content of the website. For example, if you are a plumber and want to set up a site, it may make sense to consider a domain name that ends in .PLUMBING. Can consist of letters, numbers, and hyphens. Cannot start or end with a hyphen. No space is allowed in a domain name. It is often a good idea to have keywords in the domain name. Not only does it reinforces what your domain is about to your visitors, but you also get some bonus points with search engines in that you may receive a higher ranking due to the presence of the keyword in your domain name. There are often abbreviations in a particular industry that are not recognizable to people outside of that industry. If you use that abbreviation in your domain name, you run the risk of your domain name not having the desired impact on your intended audience. One way to tell if abbreviation will be an issue is to search that term on Google. If most of the results in the top 10 have the same meaning as what you are thinking of, it should be safe for you to consider that abbreviation as a keyword. Otherwise, stay with the fully spelled-out version. Domain names should be as short as possible. This way, it is easier for people to remember and type. There will be times when you need to say your domain name, and having a domain name that is easy to pronounce is important. Not only does it make it easier for you to say it, but it also makes it easier for people to remember it. While it is permissible to have hyphens in your domain name, it is in general not best practice to use hyphens. The biggest issue is that these days hyphenated domain names are often associated with spammy domains, and so having a hyphen in your domain name can lower the trust that people have on your domains. It is entirely possible, for example, that people find your results in a Google search but would not click on it because of the hyphen in the domain name. There will be times when you have a great idea, but the your first choice of domain name is already taken. If your keyword is a noun, try the verb or the adjective form; if your keyword is a verb, try the noun or the adjective form. Add something before or after. For example, add "the" before the domain name. Before you register the domain, make sure the name you are using has not been trademarked by another organization in your country. In the United States, you can run a trademark check at the United States Patent and Trademark Office here. When faced with deciding what platform to use as the underlying infrastructure for your website, it makes sense to examine the current market share. If a platform is widely used, it not only means that many webmasters are happy with it, but it also means that finding help will be easier because there are more people with experience on that platform. It is worth noting that more than half of all websites do not use a platform. Out of the websites that do use a platform, WordPress is by far the most popular. It is powered by PHP and MySQL, and is used for both blogs and websites. Joomla and Drupal are both similar to WordPress in that they are powered by PHP and MySQL. Magento, PrestaShop, and Shopify are online ecommerce platforms. They are used by websites that sell directly online. Blogger is the blogging platform owned by Google. TYPO3 is an open-source platform aimed at the Enterprise market. Bitrix is a platform with CRM and collaboration functionalities. It is often used to power corporate intranet sites. None of the website builders appear in the top 10. The website builder with the highest market share is Squarespace, coming in at #12. This suggests that even though free website builders such as Squarespace, Wix, and Weebly are easy to use to build the first website, site owners gradually migrate off them to other platforms that offer them more control and more functionality. If you are looking to build a static website, you should consider either building the site without a platform or use WordPress. If you are looking to build a blog, you should consider either WordPress or Blogger. If you want your website to have ecommerce capabilities, look to Magento, PrestaShop, and Shopify. These are the three ecommerce platforms with the highest market share. Do I need to know computer programming for any of these platforms? If you are using Blogger and WordPress, you do not need to know how to program, although knowledge of programming is helpful. On Blogger, it's useful to know HTML. On WordPress, it's useful to know HTML, CSS, and PHP. Those who want to dig deeper into WordPress will also find that knowledge of SQL is useful. If you are building your website without any platform, you should at the minimum learn HTML and CSS, which will allow you to build a static website. To take the next step and build a dynamic or data-driven website, you should know a server-side language (such as PHP, Perl or Python) and SQL, the language used to access relational databases. Domain registries are companies that make sure the backend infrastructure of the top-level domain is sound, set the policy for all domains under the top-level domain they manage, and manage a database of all registered domains for that top-level domain. Domain registries work with domain registrars to ensure that when you register your domain name, everything works as planned. For example, VeriSign is the domain registry for both the .com and the .net top-level domains. Domain registrars are companies that sell domain names to consumers, and they offer an interface for consumers to manage their domain name portfolio. GoDaddy, NameCheap, and Name.com are examples of domain registrars. Domain registrants are people who register the domain, i.e., the domain owner. When you want to register your domain name, you find a domain registrar to do so. It is okay to have the same information across all three contact categories. The information you provide needs to be correct, as all contacts with the domain registrant will be through the contact information you use to register the domain. All domain registration information is publicly available, and can be accessed fairly easily. This creates a privacy risk. Fortunately, it is possible to protect your information by adding "WHOIS Privacy" to your domain registration. With WHOIS Privacy, the Registrant, Administrative, and Technical Contact information are set to an organization called "Whois Privacy Protection Service, Inc." and contact details are set to that of Whois Privacy Protection Service, Inc. None of your own contact information is exposed. WHOIS privacy is available for .com, .net, .org, and many other top-level domains. Domain registrars usually sell this as an add-on service when you purchase a domain name. The cost of WHOIS privacy can be anywhere between free (Google Domains offer WHOIS privacy for free) to $10/year. My recommendation is that, if you intend to purchase WHOIS privacy, you should include the cost of WHOIS privacy together with the cost of the domain when you decide which registrar to go with. 1Keydata uses Name.com as the domain registrar. Name.com is competitively priced, and its interface is easy to use. Please note that we have used them only as a domain registrar and have not used any of their other services such as their hosting. You can learn more about domain names in Common Questions on Domain Names. Shared hosting means that your website sits on the same server as many other websites. The main advantage of shared hosting is its low price. Because the hosting company can host many websites on a single server, it can charge a lower price for each website. The main disadvantage of shared hosting is that because you are physically on the same machine as many other websites, if one of those websites has a problem, gets attacked, or has a usage spike, your website is also negatively impacted. In addition, you'll need to make sure your own usage doesn't exceed whatever limits the hosting company sets. Many hosting companies advertise unlimited bandwidth. This is only true as long as you do not negatively impact the performance of other sites that share the same machine. Exactly what that limit is depends on many factors, and even the hosting companies will often have a difficult time telling you. Your first hosting environment will typically be a Shared Hosting plan. Virtual Private Server (VPS) is a step up from Shared Hosting. In a VPS environment, you are guaranteed a certain amount of resources, so even though you may be sharing the same physical server with other websites, the sites are isolated and have minimal impact on one another. The advantage of VPS is that you get guaranteed bandwidth without having to pay hundreds of dollars in hosting fee per month. You also enjoy better security compared to a shared hosting plan. The disadvantage is that you'll need to be technically savvy to be able to set up the hosting environment correctly. Dedicated hosting is where you get a physical server all to yourself. The advantage is that you have complete control to your hosting environment, and you have as much power as you want. The disadvantage is the cost. Because you alone is using the server, you can expect to pay a lot more than Shared Hosting and VPS hosting. Also, similar to VPS Hosting, Dedicated Hosting requires a significant amount of technical skills. Most web hosting companies offer shared hosting, VPS hosting, and dedicated hosting. Cloud hosting means that computational resources dynamically allocated based on actual needs, and you only pay for the resources you have used. Nothing more and nothing less. The main advantage of cloud hosting is scalability. In any of the other environments, there is a constraint on computational resources such as the amount of memory and amount of disk space. In a cloud hosting environment, your website can consume as memory and as much space as necessary. There is no need to worry about running up against your limit. The disadvantage of cloud hosting is that, because of the dynamic nature of this type of hosting, you do not know exactly how much you will pay for any given period. A good example of cloud hosting is Amazon Web Services. Some web hosting companies are calling their VPS hosting plans "cloud hosting." They are making this claim because the virtual private servers are set up in a cloud environment. New instances of VPS can be set up quickly, a characteristic of cloud. However, most of them are still VPS plans. This is because you are still paying for a fixed price per period to get hosting. How do you tell which one is which? If you are paying for a package consisting of fixed amount of resources such as memory and disk space, you are getting a VPS. If you are paying based on the amount of resources you consume, you are getting cloud hosting. Some hosting plans come with free domain name registration. Is that a good deal? My personal preference is to keep domain name registration and hosting with two separate companies. If everything is with a single company, you are basically tied to that company's fortunes. For example, if your web host goes down for an extended period of time, you can point your domain name to another host if your domain name resides with a different company, and the impact to your website operations can be minimized. However, if your domain registrar is also your web hosting company, it may be difficult or impossible to change the nameserver setting, and your website won't be back up until the hosting company fixes the issues. How Do I Select A Web Host? Talk to your friends and acquaintances who have websites and find out what web hosting company they use. Friend referral is usually a great way to find reliable service, and this is especially true in web hosting. Server location matters to user experience. If your audience is primarily based in Asia and your server is located in the United States, your audience will see a delay in page rendering time. Therefore, you'll want to make sure your server location is close to where your audience is. By close, I mean at least on the same continent, and preferably in the same country. If your audience is primarily in Japan, then it's best for you to find a hosting company with a server located in Japan, or at least in Asia. A number of web hosting companies now have data centers in different geographical locations, and they often allow you to choose which data center to use for hosting your site, even for shared hosting plans. Ideally you should find a package that allows as many add-on domains as possible. When you sign up for web hosting services, you'll need to specify the domain name your hosting is associated with. With add-on domains, you can use the same web hosting package you already have to host additional domains at no extra cost. Often the cheapest shared hosting package does not allow add-on domains, so this is something to watch out for. Some web hosting companies specify a storage limit and bandwidth limit, while others do not place such a constraint. However, just because there is no hard limit does not mean that you can occupy as much space or consume as much traffic as you want. Remember, you are sharing the server resources with many other domains. What the web hosting companies are saying is, "You get unlimited bandwidth and/or storage as long as you don't negatively impact the performance of other websites on that same server." Once your usage starts impacting other sites on the same server, your web hosting company is likely to recommend that you upgrade to a higher-level shared hosting plan, or migrate to a VPS plan. Depending on what you use the website for, some of these extras may be useful, and others irrelevant. For example, if your website is a static website and hence does not ask users to put in anything, chances are good that the free SSL certificate won't do much for you. You do not want to go with the cheapest price you can find when it comes to web hosting. The saying of "you get what you paid for" is definitely true in the web hosting world. If Hosting Company A is charging 50% of what Hosting Company B charges, Hosting Company A needs to cram a lot more domains onto the same server as Hosting Company B to achieve the same profitability. This results in a less a robust hosting environment, and Hosting Company A is more likely to say that you have exceeded their bandwidth limit (because each of their servers is hosting more domains) and request that you upgrade to a more expensive plan. For shared hosting plans, we would recommend you look into plans that charge anywhere between $5 and $20 per month. Anything below $5 per month is too low. Web hosting companies often run introductory special pricing to attract new customers. This is because the hosting companies know that the switching cost for web hosting is high, and once the promotional pricing period ends (typically 12 months) and they start charging you the regular price, you are unlikely to leave. A particularly good time to sign up for a web hosting plan is Black Friday, when many web hosting companies offer significant discounts to their packages. For your first website, we recommend that you use a shared hosting plan. Your traffic level and storage needs are not going to be high enough to warrant a more expensive plan like a VPS or a dedicated server. We recommend the following web hosts. We have used their services and are happy with what they offer. A Small Orange: The Small Shared Plan offers 5 GB of storage, 50 GB of bandwidth, and unlimited add-on domains. It's $5 per month. HostGator: The Baby Plan offers unlimited storage, unlimited bandwidth, and unlimited add-on domains. The regular price is $9.95 per month. SiteGround: The GrowBig plan offers 20 GB of storage, unlimited bandwidth, unlimited add-on domains, free SSL certificate, and free domain registration. The regular price is $14.95 per month. Before you sign up, check each site to see what special discounts they currently offer to new customers. Now that you have your domain name and your web hosting, you'll need to configure your domain name setting so that whenever anyone types in your domain address in the browser address bar, the browser can fetch the content from the correct place. This is done by updating the nameserver setting of your domain on your domain registrar. When you sign up for your web hosting, the confirmation email you receive should include this information. It usually consists of two or more domain names (this is just in case the first domain is not reachable for any reason, there is a backup). Take this information and enter it into the nameserver setting for your domain. Nameserver setting changes take some time to propagate throughout the internet. Typically the domain registrars will tell you to allow for 24 to 48 hours for the change to propagate completely. However, this usually happens a lot faster. My experience has been that this is usually completed within 12 hours, and often in less time than that. A web page uses HTML to instruct the browsers how to render the content. HTML relies on tags to "mark up" the content of the page. In this tutorial we will use some of the common tags to build a simple web page. The first tag we will introduce is the <html> tag. This tells the browsers that this is an HTML page. Notice the closing tag, </html>. This signifies the end of the HTML section. Each HTML page is separated into two main sections, the header section and the body section. The header section includes information about the page, while the body section contains the actual content of the page. The header section is marked by the <head> tag, and the body section is marked by the <body> tag. This is my first website. It is simple right now, but it will grow to be something great soon. Save the file as "first.html" and upload it to your web host. 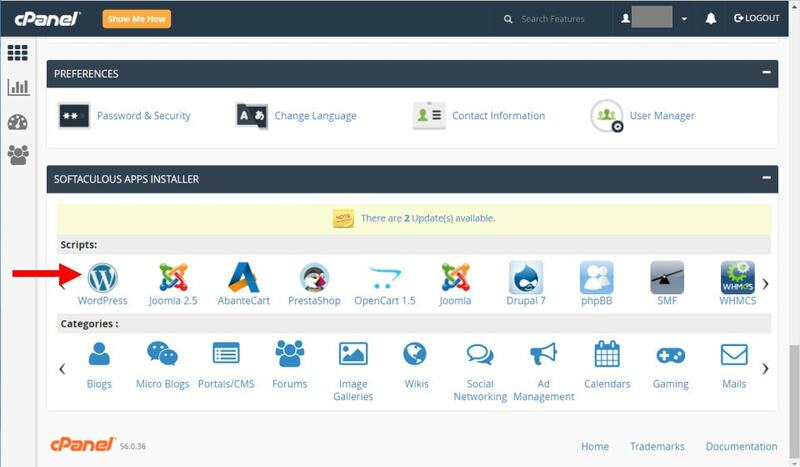 If you have CPanel, go to "File Manager," then navigate to the directory on your computer where you saved the file, and click "Upload." Congratulations! 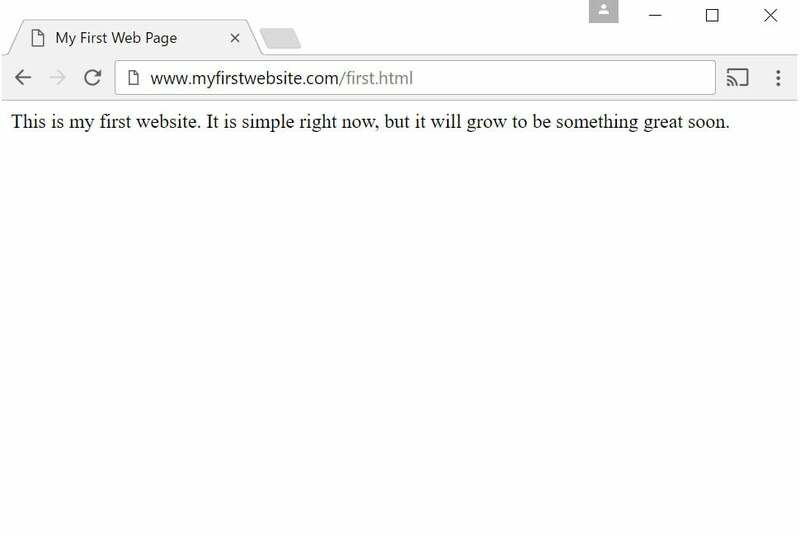 You have just published your first web page. Log in to your web hosting account's CPanel. 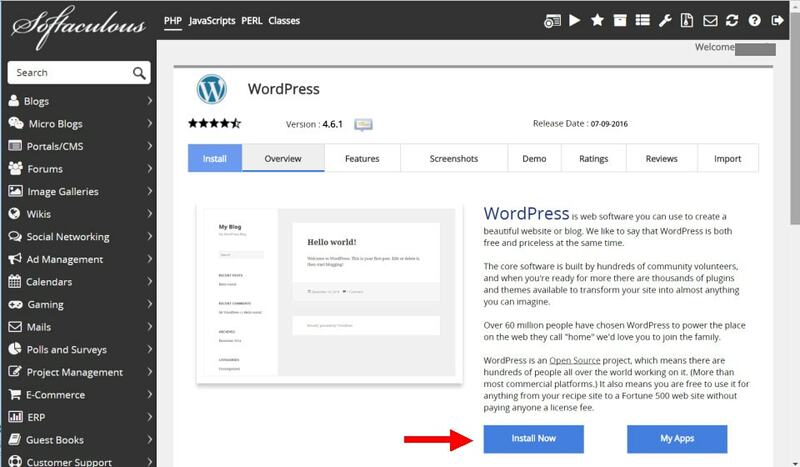 In the "SOFTACULOUS APPS INSTALLER" section, you will see WordPress (where the red arrow is pointing to below). Click on it. You will go to the WordPress installation page. Click on the blue "Install Now" button. Choose Protocol: The choices here are http:// or https://. Ideally you should choose https:// as the internet is moving towards a secured environment. If you do this, you'll need to purchase and install an SSL certificate for your site. If you are not ready to do this now and want to do it later, you can choose http:// at this time. Choose Domain: Select the domain name you want to associated this WordPress installation with. In Directory: This sets an optional directory for your WordPress administration login page. 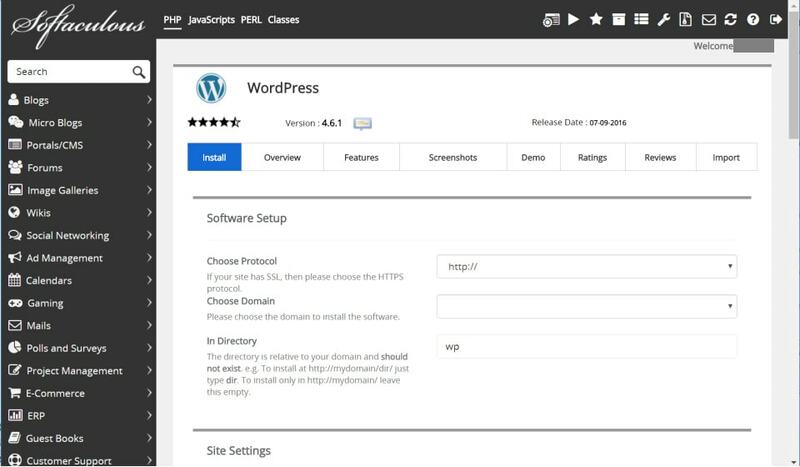 For example, if you specify "wp", your WordPress administration login page will be at http://www.yourdomain.com/wp/wp-admin. I recommend that you leave it blank. Site Name: The title of your WordPress site. You can change this setting later. For now we will put in "My Wonderful Blog." 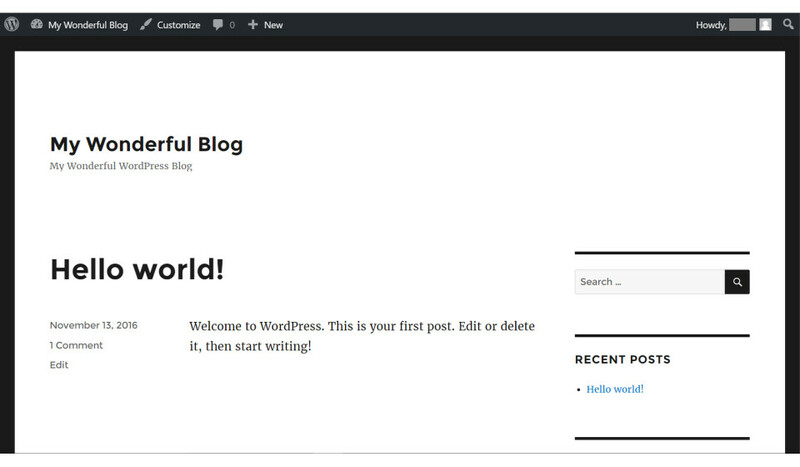 Site Description: A description of your WordPress site. You can change this setting later. 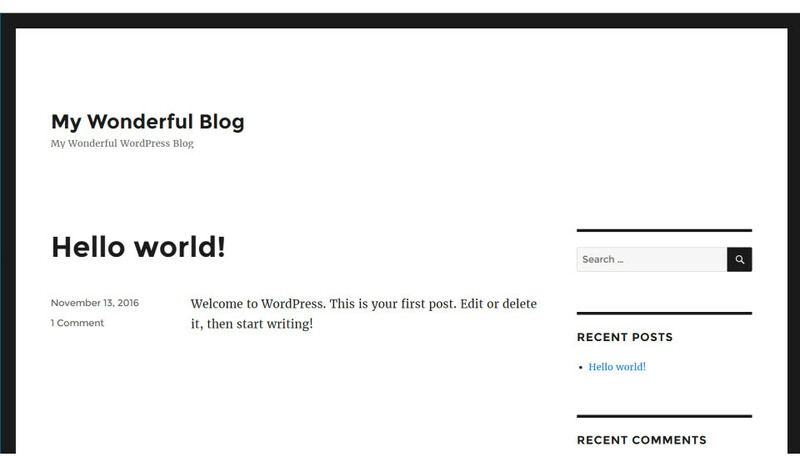 For now we will put in "My Wonderful WordPress Blog." Enable Multisite (WPMU): Do not click on the checkbox. Admin Username: The username of the administrator account. Admin Password: The password of the administrator account. Make sure you use a strong password that you can remember (you can use this password generator to create such a password). Admin Email: The email address of the administrator account. Any communication by the system to the site administrator will be sent to this email address. You can leave all other fields as default. Now WordPress will be installed. You will then see a "Congratulations, the software was installed successfully" message. Click on the Administrative URL link to go into the Administrator interface. The Dashboard is shown below. Click on the title of your blog, then click on "Visit Site" (shown below). Congratulations! You have just published your website in WordPress. 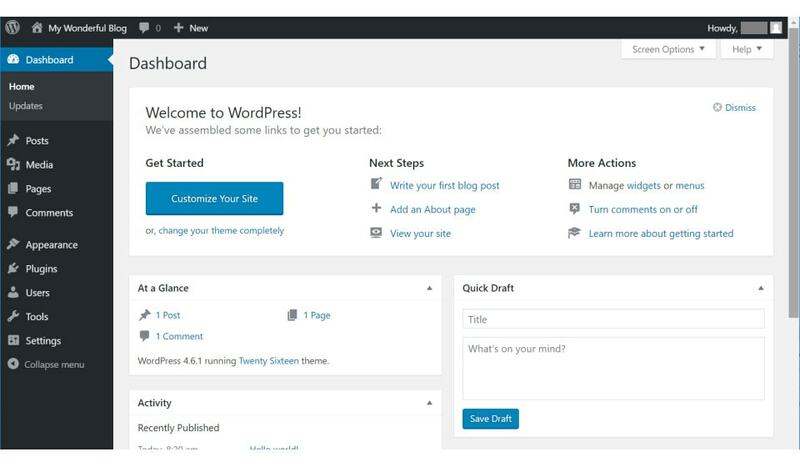 WordPress offers a lot of functionality and customization opportunities. 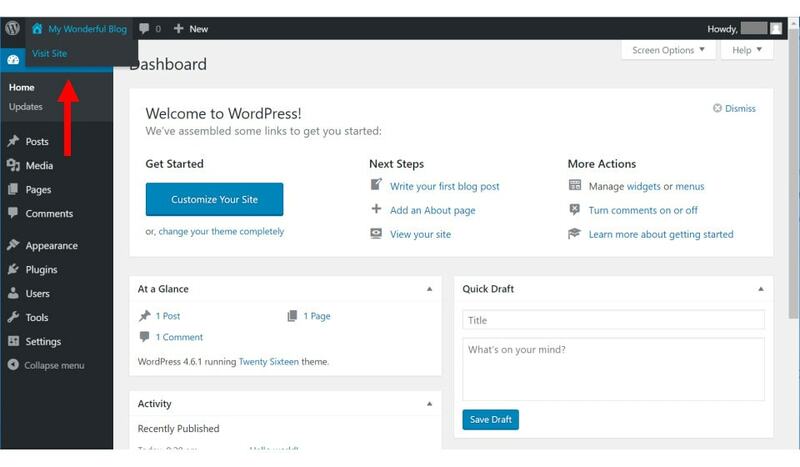 WordPress Lessons provide a number of lesson on how to get the most out of WordPress.